Start with the right drain. The better and more efficient your drain, the less chance you have of drain buildup. Shop the selection of bathroom and bathtub faucets and bathtubs and shower fixtures at Modern Bathroom, and find options that make it harder for clogs to occur. Stop large clumps of hair or soap from falling down the drain by setting a screen or grate over the opening. Today’s market has options for every fixture — including drains for bathtubs or vanity sinks. Set it in place and pull out the items that get caught regularly. If you can get into the habit, run hot water through your sink after each use. Hot water can help any oils caught in your drain move rather than build up and cause clogs. Shake in some baking soda. Once a month or so, throw a handful of baking soda in your sink drain and chase it with a kettle full of hot water. Baking soda is a powerful odor absorber and cleaning agent, which may help prevent drain buildup. The acidic nature of vinegar makes it a great tool for removing the crud that builds up in your pipes. Pour a cup of it down the drain, wait a half-hour, and pour in some extremely hot water. Pull out the big guns for clogs. If you notice a clog in your drain, act quickly. Pour a 1/2 cup each of salt and baking soda down the drain, and follow it with a 1/2 cup of vinegar. This combination will foam a little. Wait a minute and pour in 2 quarts of boiling water. 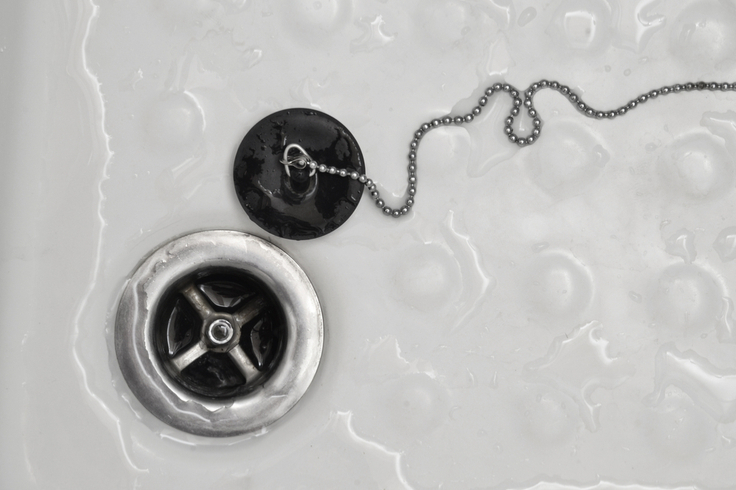 Nobody likes clogged bathroom drains — but the good news is, they can be prevented with a few basic habits. Implement the six suggestions above to protect your pipes and keep water freely flowing at home! Whether you cut your finger or skin your knee, you shouldn’t have to waste time trying to find your first-aid supplies. Keep them in your bathroom cabinet so they’re always at the ready for emergencies. Most people know what it’s like to wake up in the middle of the night with a throbbing headache. Save yourself the extra steps of trekking to the kitchen, and keep over-the-counter pain medication in your bathroom cupboard. Another common malady is a stomachache. Be prepared for indigestion when it strikes, and keep antacids in your bathroom stash, too. You never know when the common cold is coming, so be ready for it with basic cold medicine in your bathroom. Keep cough medicine, a decongestant and throat lozenges as staples. If you’re coming down with the flu or are just feeling funny, having a thermometer is a must. Keep it in your bathroom cabinet so you always know where to find it when illness arrives. The only thing worse than dealing with an allergic reaction is not being prepared to treat it. Keep antihistamines and hydrocortisone cream on hand, as well as calamine lotion, so you can respond to any allergic or itching issues that arise. In a world where skin cancer is rampant, it’s hard to be too careful about sun protection. Store sunscreen in your medicine cabinet so it’s easy to shield your skin from UV damage. A healthy mouth starts with good oral hygiene. Stock a toothbrush, plus an extra or two in case an overnight guest needs one. Likewise, have toothpaste, floss and mouthwash available. 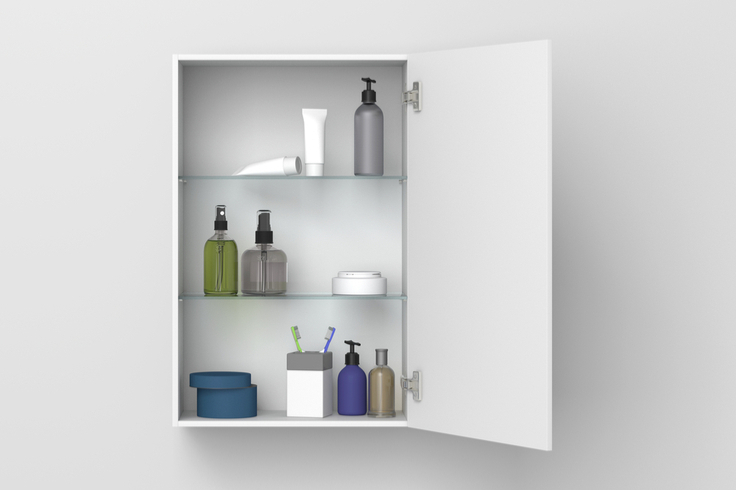 Whatever you use to get ready each day, keep it supplied and organized in your bathroom. This includes makeup, hair products, moisturizers, shaving cream, etc. Even if you don’t use cotton swabs and cotton balls every day, it’s nice to have them available. Likewise, stash feminine products and other personal paper products in your bathroom storage so they’re there when you need them. The better stocked your bathroom cabinet items, the more prepared you are for life’s unexpected changes. Use the tips above to organize your space. If you’re designing or renovating a bathroom and looking for new components, visit Modern Bathroom to learn more about the best in bathroom storage and bathroom vanities! Yes, it’s really that simple. 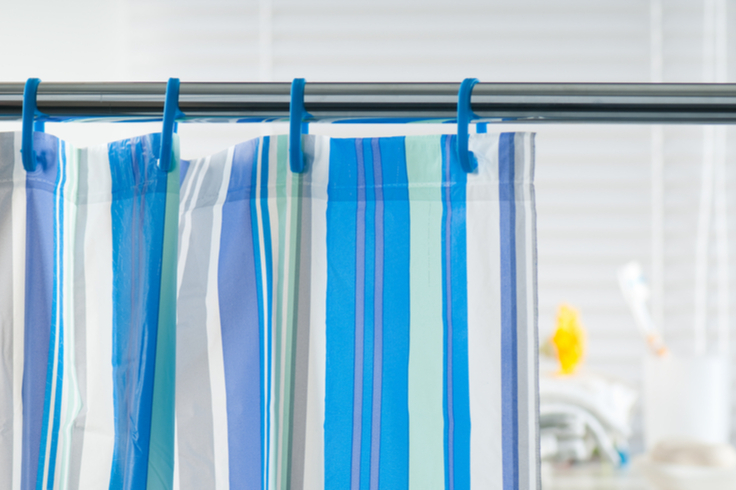 You can wash a plastic shower liner right in your washing machine. Just make sure to remove the hooks first so they don’t damage the machine’s interior. Since the liner is plastic, you don’t want to take any chances of it melting. Always use the coldest water setting available. While you can probably use regular laundry detergent with success, using either vinegar or baking soda (not both!) instead will usually produce better results. These cleaners are proven to tackle stubborn mildew with ease. NOTE: Do not use liquid fabric softener on the liner — it will do nothing but make your shower liner smell like chemicals. Before starting the load, add a couple of bath towels. The towels will help provide additional agitation during the cleaning process to help scrub the mildew off while it is being washed. • Open the bathroom door when your shower is over to help the moisture dissipate. • Open a window while you are showering to help the steam escape. • Turn on the exhaust fan both during and after the shower. • Spread the shower liner completely when you’re done showering, so the entire surface area has a chance to dry. Now that you know how simple it is to clean your shower liner, there is no reason not to do it regularly (it is recommended every three months). With a clean liner, you can keep your bathroom shower smelling great without having to worry about inhaling dangerous toxins — that’s a win-win and definitely worth the effort. Anyone who’s experienced bad breath can tell you it’s an embarrassing condition. Smelly breath is distracting, makes others uncomfortable, and limits the intimacy of close conversation or kissing. That’s exactly why, if you’re dealing with this frustrating problem and wondering what to do, it’s time to think about tongue scraping. Believe it or not, this simple step can make a big difference in freshening your breath and oral health! Here’s a look at what tongue scraping is, why it’s beneficial, and how often you should do it for the best benefits. Tongue scraping is exactly what it sounds like: using a designated tool to scrape your tongue, removing bacteria and dead cells in the process. Because the particles on your tongue can cause bad breath, removing them through tongue scraping may also eliminate the accompanying odor. Tongue scraping helps you get rid of more odor-causing bacteria than you could with just brushing. A tongue scraper can help remove harmful bacteria on the tongue, leading to a lessening of bacteria in the mouth as a whole. Because bacteria such as mutans streptococci and lactobacilli are sometimes associated with bad breath, lessening them is a step toward a fresher, better-smelling mouth. Removing bacteria is not only good for preventing bad breath, but also tooth decay, gum disease and other conditions. Another surprising benefit of tongue scraping regards taste. The cleaner your tongue, the better you may be able to distinguish and enjoy bitter, sweet, salty, etc., foods. At minimum, scrape your tongue every time you brush your teeth. This can help prevent ongoing bacteria buildup. Keep in mind, however, that scraping your tongue only removes the current bacteria in your mouth — it doesn’t prevent future bacteria (or bad breath) from developing. If you’re fighting breath odor, you’ll have best results from scraping your tongue after every meal. For a simple, effective way to improve your breath and oral health, add tongue scraping to your hygiene routine. When combined with an overall dental care plan, it can be a great solution for better breath.